Anniversaries help us recall events of the past, many of which impact us to this day. While I would just as soon forget the Watergate break-in perhaps we ought to remember if we don’t want to repeat. 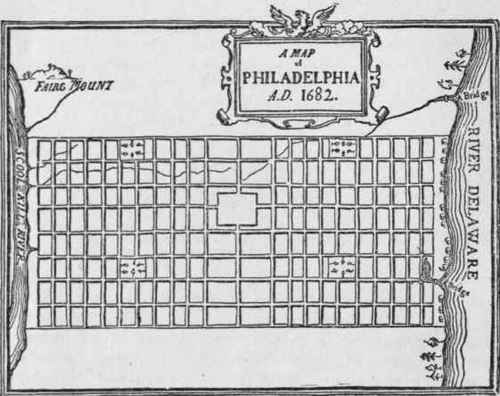 On the other hand I am grateful to Mr. Penn and would be delighted to celebrate what has become “my” city—if there were any celebrations planned. Of course three weeks from now the City of Brotherly Love will once again celebrate the most significant event in Philadelphia history. Folks in colonial costume will read the Declaration of Independence from the steps of Independence Hall and a fife and drum corps will play. Later concerts and fireworks all over the country will give people an opportunity to at least recall why we roast beast and shoot off rockets. celebrations that took place mostly in England this week. The 800th anniversary of hapless King John being forced to sign the Magna Carta (June 15, 1215) got press even in the U.S. The document that set England on the path to limited, constitutional monarchy led eventually to the American Revolution and, so we’ve been told, the Bill of Rights. While much of it is irrelevant today, it established that the king is subject to the law and not above it. The rule of law is no small thing and well worth celebrating. Celebrate they did. The queen and prime minister both attended ceremonies at Runnymede, the site where John caved in to rebel barons. It took place by the monument erected, oddly enough, by the American Bar Association. There have been articles written, seminars held, a musical produced, merchandise sold, and (my favorite) a nation-wide plan to lift a beer and say “Cheers to the Magna Carta.” I wish I had known that one on Monday. While it probably will prove to have less impact on history over time than Magna Carta, the second event has gotten rather more attention in England, if less over here. That is the 200th anniversary of Napoleon’s defeat at Waterloo. Earlier this year I wrote a piece on the battle’s impact on fiction. While the importance of the battle (and BBC did a nice piece on that) may not be well understood today, I continue to be struck by the degree to which it fires popular imagination. 5,000 re-enactors, 150 civilians in period costumes, 300 horses and 100 cannons are expected to take part in reenactments this weekend. Various other reenactments and ceremonies took place this week at sites with any connection whatsoever to the famous battle and/or those who fought there. Museum displays have blossomed, books (both fiction and non) have been written, college courses on the battle created, and an entire panorama of Napoleon’s life (including the defeat) produced using 1.2 million Lego blocks. For those of us perhaps not totally up to speed on nineteenth century tactics, The Telegraph created an animation to explain it all. Or listen to Wellington’s own words describing the battle as read by Hugh Grant. Aficionados have kept the run up in our minds day by day: the Duchess of Richmond’s ball June 15, Quatre Bras and Ligny when the French came close to winning it all June 16, and Waterloo itself on June 18. Social media lit up all week. Use the hashtags #waterloo or #waterloo2015 carefully. You’ll be buried. As to me, I’m happy to remember all these events. If I could have joined in one celebration, however, it would have been the reenactment of the Duchess of Richmond’s Ball, when ladies in their finest entertained the officer corps until word came of the French approach and the Prussian withdrawal. The men began to quietly slip away so as not to cause panic. 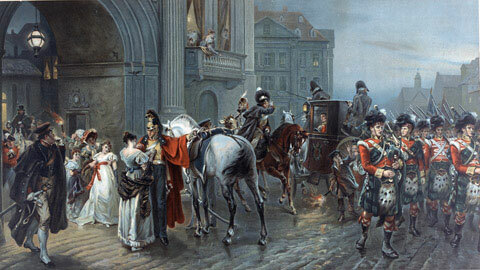 Wellington himself appeared calm, and the band played on, the bittersweet air of a glamorous event overshadowed by tragedy. Yep. I’d like to dress up for that one. ← The Sons Of Liberty–A Band of Thugs, or The Loyal Nine? As always, thoughtful post. Let me add two other anniversaries from mid- to late June (and I doubt either would be reenacted, nor do they deserve to be): the last two invasions of Russia, by Napoleon in 1812 and Hitler in 1941. Interesting and informative as always, Caroline. Wish I could have been in England for the 800 year anniversary. 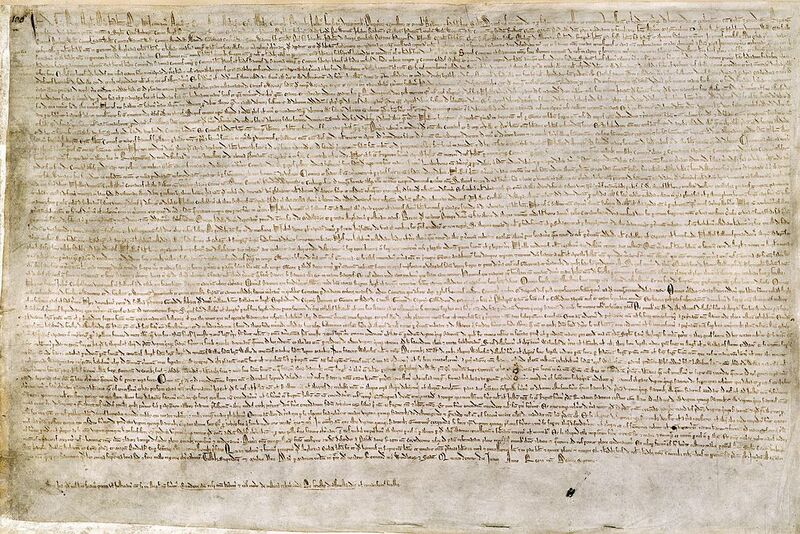 Magna Carta’s far reaching impact was something its authors could never have envisioned.